From Baltimore/DC: Take I-97 S and/or US-50 E to MD-33 W. Proceed along 33 for 10 miles. From Philadelphia/NYC: Take I-95 S to US-301 S to US-50 E to MD-33 W. Proceed along 33 for 10 miles. Inn at Perry Cabin and its award-winning restaurant Stars remain the only Forbes-rated destinations on the Eastern Shore. 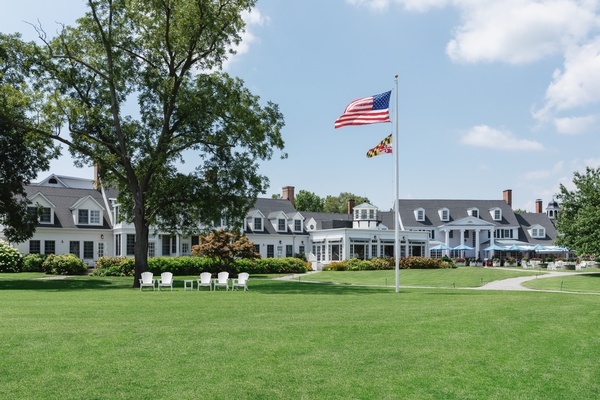 Named #1 in the Mid-Atlantic this year by Condé Nast Traveler Readers' Choice Awards 2017 and #1 in Maryland by Travel + Leisure, the Inn is tucked along a private corner of the Chesapeake Bay. Its nautical charm and casual elegance inspire a genuine sense of escape and relaxation. No two of the boutique resort's 78 guest rooms are exactly the same, but they all offer an intimate and romantic feel—some with private garden verandas, some with water-front terraces, some with plush sitting areas and fireplaces.